This squad of Death Korps of Krieg Grenadiers is something I've been working on for a while now. I've always thought these guys were so cool looking and wanted to see if there was a way to take a regular Imperial Guard squad and convert them into DKOK. I knew it was going to take some work, but I figured it could be done. The biggest thing that made this possible has been the introduction of third party bits that provide the "great coats" so many players want to have. The ones I decided to go with come from Secret Weapon minis. Both the coats and the gas mask heads come from SWM. They are the key bits to this whole conversion really. The rest is some minor plasticard and greenstuff work. This post is more of an overview of the project. Once I get them finished up in the coming month or so, I'll go more in depth on the construction and the painting. Since I'm not there just yet, I figured I'd share more of a WIP type thing with you all. I this case I've got a few pictures of the squad Sergeant model. I think my friend is going to play them as regular Guard models and keep the DKOK aspect just for looks. That's perfectly fine with me, I'm really just trying to work through the whole squad as a personal challenge. I've since gone back into the model and added some leg armour on the guys along with some additional shoulder armour plates for an overlapping look and the giant cuffs they have at the ends of their sleeves. It makes them look a bit more finished overall. Just adding those few details has added even more character to the unit, but it's increased the work on each model ten fold. Every little detail you add to one model you have to do to all ten of them. It adds up fast. So far, I think the Sergeant is coming along nicely and has a great look to him. 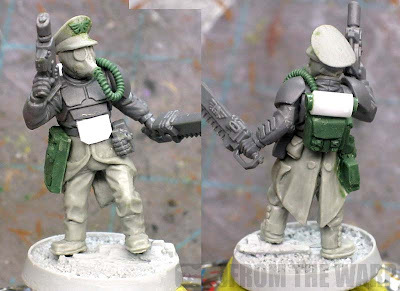 He's not DKOK exactly, but close enough that with paint, he'll be recognized for what he should be. That would be a win for me. Once I get the squad built, I'll share some more pics of the guys along with a step by step showing all the things I did to convert the squad for folks who want to do something similar. It's a bit time consuming to be honest, but not that hard in the end. Great project, you certainly have an eye for possibilities! Looking good. That breastplate seems a tad too straight atm though. Very cool! There is a tiny it of disconnect between the torso and the legs. He looks a little long in the middle. Is that why you added the abdomen plate? Definitely looking forward to seeing where you go with these. Are you using the rolled helmet heads for the standard troopers? I love this look, if I had the money I would have a whole guard army modeled this.way but geared towards the ruinous powers. 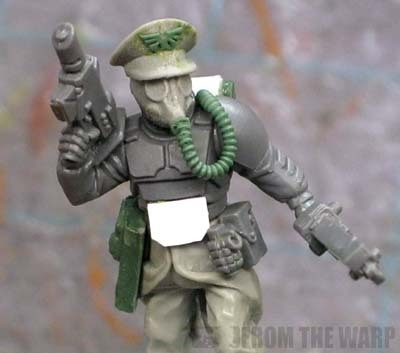 most people model traitor guard all knarly and ragged and torn but I imagine them to be really dark and regimental like Nazis with lazors. It'd have to be the black legion PDF or Emperors children PDF if I ever get chance to do it but if the British recession carries on the way it is it'll just have to stay as hobby dream for me. oh yeah by the way Ron the model looks ace, I can't wait to see the rest of the squad. sorry for going off on a little ramble of hobby thoughts back ther lol. Looking good, Ron! I ran across those SWS legs and heads at GenCon a couple weeks back and was sorely tempted. Now I'm wishing I'd picked some up! Zaphod Beeblebrox: I think that may be the pic. I had to give it a slight curve so it fit the body better, but it doesn't appear that way up there. TheRhino: Yes and the Grenadiers also have the extended armour plate like that. I think it looks odd because the coat is buttoned so far down. We expect to see it come apart right at the waist and not lower like it does. Either way, it does catch your eye and I'll have to work on that. Kevin: I don't know. Even if it is cheaper, you will definitely pay in terms of work you have to do. There is a ton of work that goes into each one. You'll "pay" one way or another when it comes to conversion work or Forge World models, it just depends on what you prefer. This is one of those ideas that I've kicked around myself for a while. If you wanted to mimic the skull-plates on their helmets, you could always try Necron warrior heads, sans lower-jaw. Sculpting on the eye-lenses and stahlhelm would probably be more trouble than it's worth though. JW: I do like the skull helmets, but I'm going to see what I can do with limited greenstuff and bits. Sometimes I feel like there's a point where you're just better off buying the real thing and saving yourself all the hassle. I'm trying to get as much bang for my buck as I can here without going overboard. Dunk: I'll be doing a complete step by step when I put one of the rank and file guys together in the coming weeks. That way anyone can reproduce the effect.